It is time once again for Bread Baking Day! This month’s theme, breakfast breads, was chosen by the lovely Melissa at Baking A Sweet Life – merci, Melissa! She’ll be putting the round-up of all our entries on June 5th, so go take a peek and be inspired! I feel as though baking scones is a bit of a rite of passage in vegan culinaria. The vast majority of vegan blogs I love to visit have showcased at one time or another beautifully baked scones, with flavours ranging from peanut butter to pumpkin, even scony breakfast sandwiches – and admittedly they looked rather tempting. It also seems that no vegan cookbook would be complete without at least one (or multiple) scone recipes. 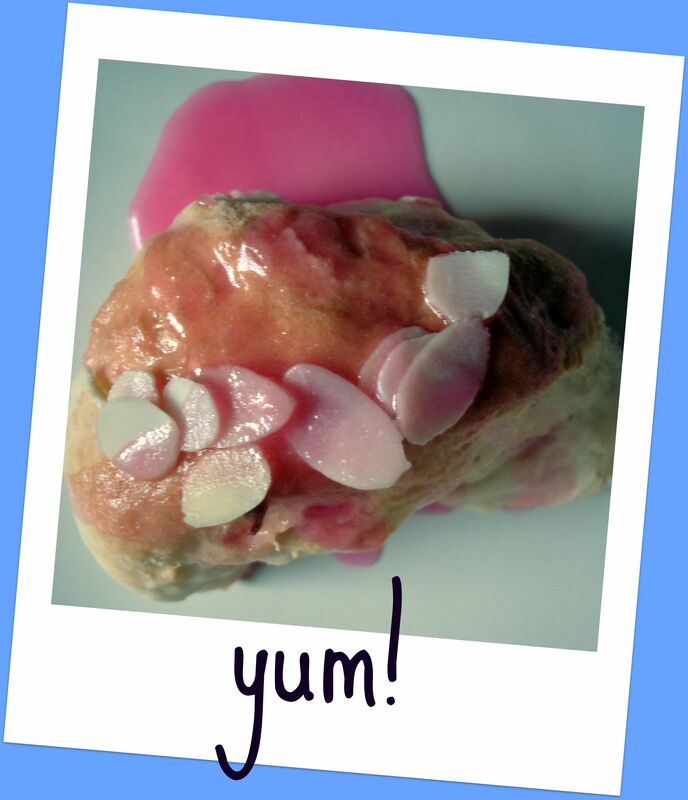 While the photos on the vegan blogosphere seemed enticing, I had scone issues. I’d only ever had scones on two occasions, and they left rather tasteless impressions on me. The first time was in a rather trendy tea room in London about 16 years ago. Everyone had hyped this amazing place with its brilliant scones and the clotted cream is bloody phenomenal! I sat uncomfortably, surrounded by 4 very hip and trendy and (seeming to 17-year-old me) sophisticated 25-year-old Londoners. I wanted to be cool, suave, and as cosmopolitan as they were, and when I bit into what I thought was a mixture of sawdust and cardboard I forced a smile and raising my eyebrows I declared,”It’s like nothing I’ve ever had before!”, which was true. I managed to avoid the clotted cream (because it sounded like something that should be thrown out because it had gone bad), and got about half of the thing they called “scone” into my handbag to be discreetly thrown out later without anyone noticing. Scone session numéro dos was about 5 years later, with a much older and wiser Shellyfish (irony) surrounded by terribly cool people on a fashionably hip terrace at an over-priced trendy café in the desert Southwest in the U.S. My fellow brunchers were, in my eyes, what I wanted to be when I grew up : young 30-somethings, so for me, grown ups – there was the witty newspaper editor, the bohemian graphic designer, the sullen musician, the dreamy poet, and me, the dancer/student who dabbled a bit in freelance journalism and poetry, but who felt like an insignificant speck of wanna-be talent next to my friends. I came back from the washroom to find scones & coffee on our table, and sullen musician smiled with shocks of hair falling in his eyes and said, “you lived in Europe right, so I thought you would like these. I think they’re European or something.” Trying not to swoon because sullen musician knew something important about me, I forced down what felt like a hockey puck made of baking powder, but smiled through the entire ordeal. I’m the young 30-something now, and have thankfully re-adjusted my focus a bit (and my friendship criteria). I wanted to move on in the scone department, and thought this BBD was the kick in the pants I needed to make the scones. Hundreds of snappy vegans couldn’t be wrong after all! I based the following on the Orange Glazed Scone recipe in VWAV, because I am all about eau de rose lately (new and unusual). I wanted to use pistachios rather than almonds, but Mr. Fish depleted our stocks while watching a “Zombie sharks attack the vampire monkeys of New York” type movie the other night. The almonds were great, though. I’m also happy to say that the scones were, too. They were light and flaky and delicate as the rose itself! Heat oven to about 200c/400f. Add the vinagar to the milk and set aside. Sift together the flour, meal, baking powder, sugar, and salt in a large bowl. Add the vinagar mixture and the rosewater & almond extract and stir until just mixed. I needed to add a little flour here because things were still rather wet. Dump out the dough and divide in two, knead a little and form into a bit of a disc and cut into pie-like wedges. Place on baking sheet and in the oven it goes for about 15 minutes or until slightly browned. For the glaze add about 120g icing sugar, 2 tablespoons of melted non-hydrogenated margerine and 3 tablespoons eau de rose in a bowl and stir until well combined. You can get festive and add some food coloring if you wish (I did). Drizzle over scones and sprinkle with slivered almonds. I’d also like to thank Ms. Zorra, the founder of this great event. Helping me to try new things, one bread at a time!